For a lot of people, mobile means a laptop. When it comes to easy access, that’s like carrying around a bunch of bricks. If your crew is waiting while you haul out a computer, boot it up, and hope it has enough juice to let you find the documents you’re looking for, it’s costing you time and money. 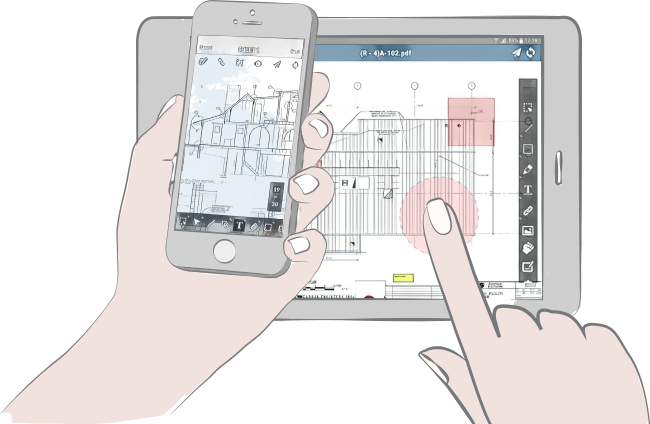 SKYSITE mobile platforms work on Apple® and Android® phones and tablets, putting documents in your hands in seconds. SKYSITE even lets you sync the files you use the most, directly to the device, so you can get to them even without Wi-Fi or Internet. Once you get your bars back, it automatically updates any changes you made. Reduce cost and save time using phones & tablets instead of laptops. Provide low-cost and even no-cost access to partners and vendors who use their own devices. Make sure you have your files, even without Internet, when you use offline access. Handle Punchlists, RFIs, and other tasks anywhere you are. Underground, on a jobsite or in a parking lot, SKYSITE’s mobile access keeps you connected.